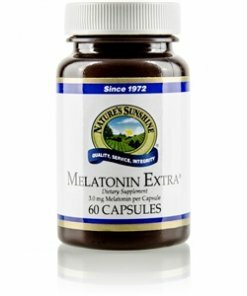 Nature’s Sunshine Melatonin Extra® blends 3 mg of melatonin with ginkgo biloba concentrate, ginkgo biloba leaves, eleuthero, and vitamin E. Produced by the pineal gland, melatonin helps regulate proper energy and sleep. Over time, the body produces less melatonin, and supplementation may become necessary to maintain healthy sleep rhythms. 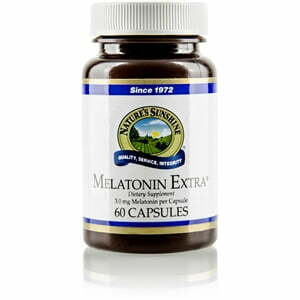 Additionally, melatonin may boost energy levels and alertness after a good night’s rest. Melatonin may also have antioxidant properties and provide immune support. Instructions: Take one capsule daily, 30 minutes before bedtime. Drink 1 glass (8 ounces) of Nature’s Spring water with the capsule. Cellulose (plant fiber), magnesium stearate (vegetable), gelatin, and water.